1. Those that are Christ followers. These are the people that are genuinely sold out for Jesus. They screw it up sometimes, but they follow Jesus as very best as they know how. They’re like the disciples in Jesus’ day. They follow Him, they glorify him, they let his glory shine through them, and they don’t mind admitting when they screw it up. 2. Those that are religious. You know those I’m talking about. The people that call themselves ‘Christians’ and ‘Christ followers’ but live as if he were just a rule maker and people hater. Those people are like the Pharisees of Jesus’ day. The Pharisees were so convinced they were right and everyone else was wrong that they missed the Savior standing right in front of them. 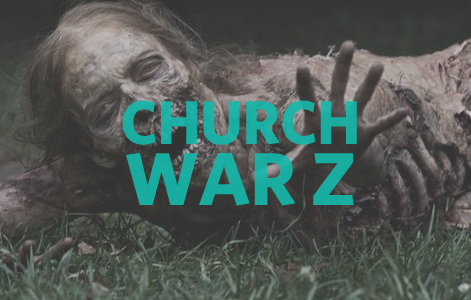 The Pharisees are like the walking dead. That’s what’s dangerous about them. They often don’r realize who they are and so they walk around and spew their poison on others. They’re so good at it, others in the church and those around them begin to believe it themselves. Religious people make more religious people if they’re allowed to. Have you seen the movie “World War Z”? Do you remember when the dude was willing to chop off someones arm so they wouldn’t be infected with the human killing zombie juice? We have to avoid becoming religious at all cost… it’s deadly to us and the kingdom. Matthew 23:2-4 “The teachers of the law and the Pharisees sit in Moses’ seat. 3 So you must be careful to do everything they tell you. But do not do what they do, for they do not practice what they preach. 4 They tie up heavy, cumbersome loads and put them on other people’s shoulders, but they themselves are not willing to lift a finger to move them. good site. i look forward so that all Christian people able to know Jesus in the spirit and truth.. I see this kind of argument a lot but I think it misses the mark. First, why is being “religious” so bad? James says that true religion is looking after widows and orphans. Jesus was “religious” in that he was not secular. Why don’t we call people under your “religious” heading “wolves in sheep’s clothing” or simply “non-Christians?” If they aren’t Christ followers, their not Christians. They may THINK they are Christians but being a Christian ISN’T shown by a “profession of faith” but by bearing fruit. If they ARE Christians, then you are adding to the noise that divides the body.